Now here's a great gift idea from Australia - a Kangaroo corkscrew from Riccardo. 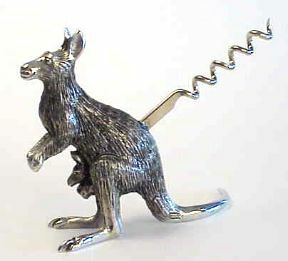 Although it is a direct pull corkscrew and takes a little effort in use, the Kangaroo's body is nicely shaped to fit the hand. The kangaroo stands 3 1/2 inches high and retails for AU$50. ...turn him over and you'll find the worm folds out from underneath. 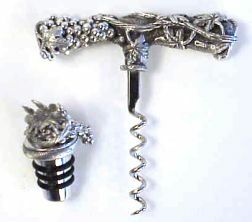 Not the most practical corkscrew but, remember, this is a work of art that will be treasured when received as a gift..
Rounding out Riccardo's corkscrew sculptures is a grape and grapevine design direct pull corkscrew accompanied by a bottle stopper. Riccardo Pizzimento and his son operate their firm as Pewter by Riccardo, the trade name of Barrohart Pty. Ltd. of NSW, Australia. 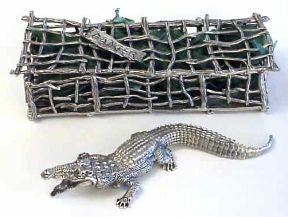 The material of the their products is lead free Pewter from Australia with a content of 96% tin.